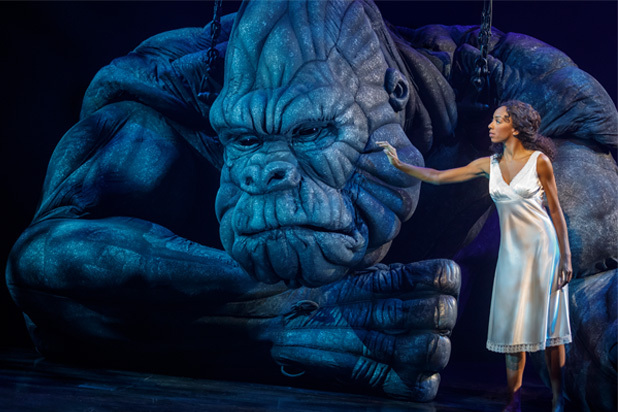 With a budget as big as its subject matter, King Kong opened officially on Broadway on November 8th after its world premiere in Australia several years ago with a new book by Jack Thorne (Harry Potter and the Cursed Child) and new songs by Eddie Perfect. As a spectacle, the show lives up to the hype with the 20 foot gorilla puppet beautifully animated by a large team both onstage and backstage. The special effects are great, with luscious electronically-generated backgrounds that blend seamlessly from one scene to another. Turning the stage into a ship which goes up and down over the waves towards Skull Island was effective enough to make a few fellow theatregoers feel seasick. Unfortunately, this is where the good news ends. The story is messy - it seems to have borrowed hugely from the Eter Jackson film, but is overly simplistic. In fact, the only character you end up caring for, is the one which cannot speak or sing. Ann Darrow (Christiani Pitts) is now a politically-correct “empowered” actress who doesn’t play a damsel in distress. This is ludicrously demonstrated through her refusal to scream, but to growl instead. Pitts has a nice singing voice but her diction should be improved. Ann is lured by Carl Denham (Eric William Morris), a producer who promises to make her a big star, and there isn’t a single redeemable feature about this character. Rounding up the major human cast with cliched lines is Lumpy, played sympathetically by Erik Lochtefeld. There is no love story, and any relationship reference between Ann and the ape feels like a convenience. Whilst the rest of the company do their best in the background, that’s where they are firmly kept. Drew McOnie does a great job with choreography as usual, and manages to coax a few emotional beats out of this lacklustre book. It doesn’t help that the songs are mostly weak, uninspired, and forgettable. Marius de Vries does a marvellous job of orchestrating a suitably-movie like score, filled with thunderous timpani and rousing strings. Thankfully, this heightened score makes some of the action sequences a bit more watchable. Kudos to the animation and effects teams who brought the puppet wonderfully to life in a show that is all spectacle but little else.